In just 2 short days, this love of my life will turn 5 months old. * She is rolling over both ways. 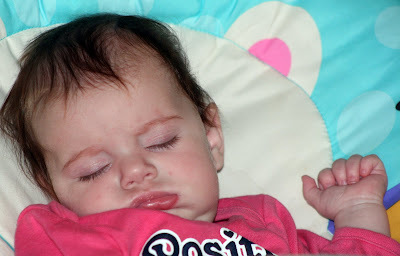 *She is no longer having poop problems, thanks to pear juice in her bottles and a very expensive formula. By 5 months old, she should be focusing on an object and following it. She should be following us as we walk in or out of a room. She should be looking at our face when we hold her up and speak to her. She is not doing those things. I suppose I knew that she wasn't a couple of months ago. But when I noticed that she wasn't doing those things, I was too focused on her ears to worry about her eyes. I'm not worried. Our God is big. I was diagnosed with nystagmus at almost her exact age. It is a great possibility that she is a carrier for this same thing. It is also a great possibility that she is not and that God will prove Himself awesome once again! This is what we are believing. So tomorrow I'm going to take her to her pediatrician to be seen and hopefully referred to a pediatric opthamologist. And then we will get some answers about Mabel's eyes. Answers that we already know because we serve a mighty God...but because we live here in this world we have to go through the motions. I'd love for you to go through them with us and pray for our lady!!! In the meantime, I'm gonna watch her sleep and swing and smile and coo. She's so beautiful I can't stand it. Happy 5 Months Miss Mabel! You're absolutely right in saying that she's beautiful and perfect. I have faith and trust that everything will work out. Thank you so much for keeping us updated on this one. I look forward to knowing how everything turns out. Praying! How is it possible that she is 5 months?? She just gets sweeter and sweeter in every photo. Praying for Mabel - she is so sweet.